Courtney DeFeo + Leah talk about what it looks like to do “the thing” that you feel like is inside of you to do while checking our motivations and owning your differences. Courtney DeFeo is most known for being a factory of ideas for families. It’s her desire to lead a life that radiates God’s love in action and His grace along the way. As a former marketing professional for corporations such as Chick-fil-A and Ketchum Public Relations, Courtney has a history of creating memorable programs and ideas that motivate others to action. She is the author of In This House, We Will Giggle, creator of ABC Scripture Cards and Virtue Cards and the kindness movement Light ‘Em Up Acts. She is a sought-after speaker and contributing writer appearing on familiar sites and stages such as Focus on the Family, Mops International, Buckhead Church, Proverbs 31 and Parents Magazine. Her newest project is a mother/daughter community for tweens and can be found at TreasuredGirlz.com. Courtney’s most honorable mention is her husband Ron and their two wildly creative girls (Ella, 11 and Larson, 9). Connect with Courtney at CourtneyDeFeo.com. As a mom, yes, I absolutely want my kids’ birthdays to be special. And I’m all about doing that through meaningful traditions instead of more “shoulds”, Pinterest pins, or monster gifts. At our house, we do a birthday breakfast out, the kiddo chooses the activity, and the meal and dessert for the night. And this year we’ll be adding another tradition – The Birthday Note Box. 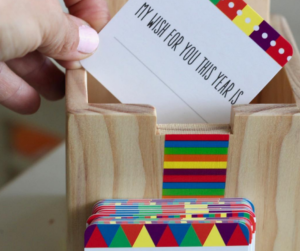 This box has cards that offer you a fill-in-the-blank so that you can personalize the notes for your birthday kiddo. I can’t wait to use these with our kiddos when birthday season kicks off this summer. I’ll have to grab another set – my kiddos ripped our right open and used it for a friend’s birthday. It was so sweet to watch them think of sweet things about their friend!! 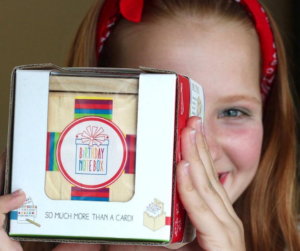 You can check out the Birthday Note Box and the other great Star Kids products here.